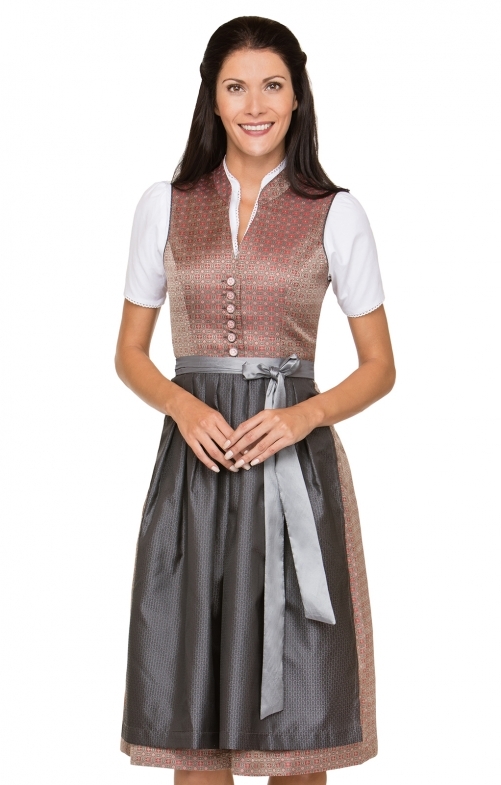 Midi dirndl Florina for women by Stockerpoint in rouge and anthracite. The high-necked Dirndl made of fine jacquard fabric enchants with the traditional V-neck bodice and a raised collar. The hand-made, colour-coordinated buttons with flower optics refine the overall appearance. The feminine, pleated skirt is equipped with a side pocket. The harmoniously coordinated apron in matching design is wonderfully combined and characterizes this unique traditional style. Eher klein geschnitten! Ruhig 1-2 Nummern größer bestellen!